Happy 5th birthday to my sweet little niece, Jaina. 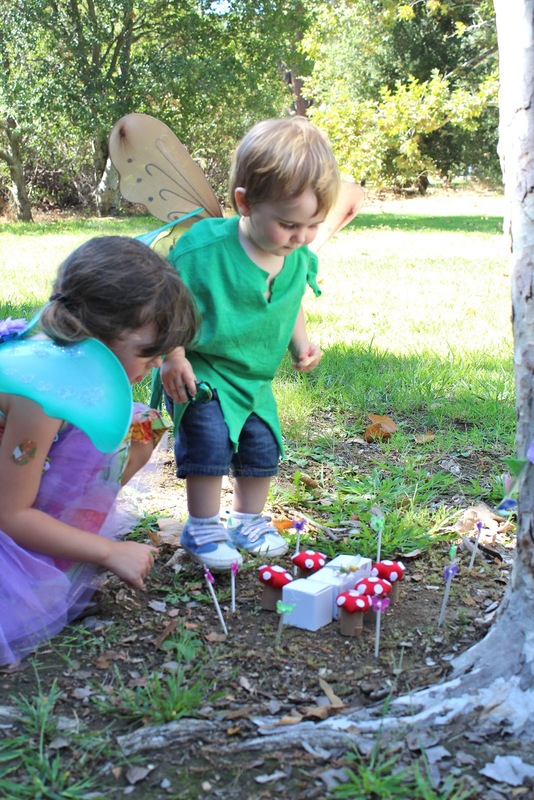 I had so much fun throwing her a little fairy party! 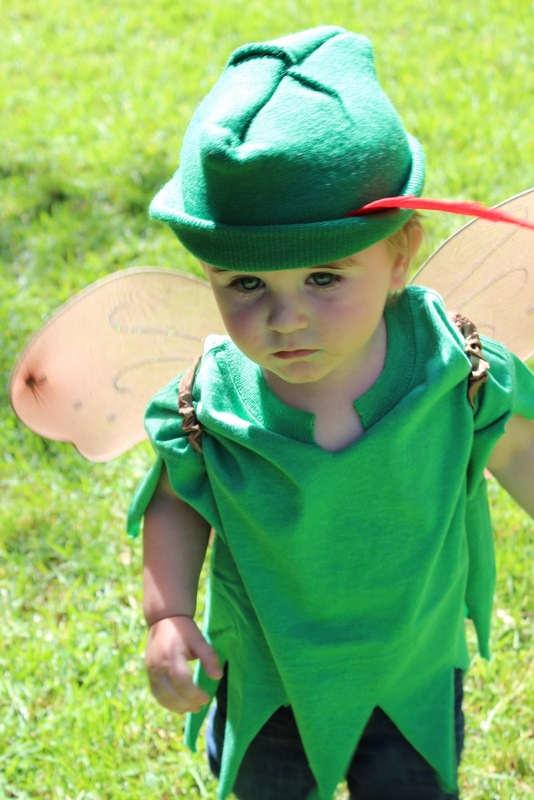 I spent the week before the party decorating fairy wings, and making peter pan like costumes for the boys. I made paper mache toadstools, sewed fabric banners, and made 9 little toadstool stools for the kids to sit on at the tea party. You can just see a little bit of all of this peeking through the pictures with the kids. As usual my grand plans of taking pictures of everything once it was set up was thwarted by the inevitable mad dog rush that happens right before party time. Thank goodness that in addition to the fairies showing up our good friends Jeff and his daughter Emily who couldn't stay for the party came early to help Dale and I set up. 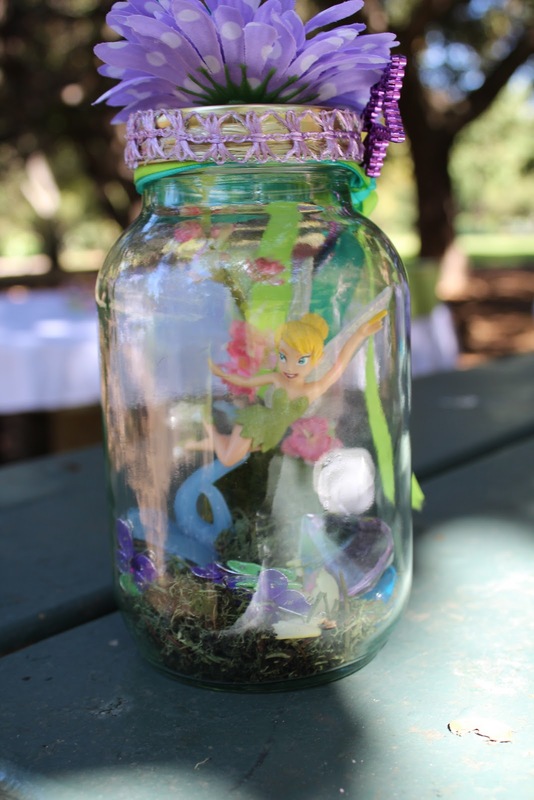 We had an absoulutely beautiful day in Irvine Park that made the perfect fairy setting! My nephew Gavin wore his little fairy wings and costume the whole time. He was so adorable toddling around in it! Jaina and her little friends having "tea". The tea party table with toadstool stools! The fairy table with toadstool seats, before it was set for tea. Giant bubbles for the fairies to ride on! Give a boy a sword and there is no end to the fun running around that they will have! Plus it balanced things out nicely with the wands for the girls. The kids hunted for little trinkets and treasures and added them to their fairy jars! The boys recieved small knights for their jars. There were lots of laughs and giggles when Dale suited up for the Gnome on the roam game! (the kids had a good time too!) It was basically tag but if the kids touched him with their wand or sword he had to freeze and throw out candy! The kids loved this! The adults cracked up! I made a miniature version of the party for the fairies and set it up behind a tree for the kids to find. With all the running around I thought for sure they would find it and left it as a surprise. I realized once the party was over...it was never discovered! We led Jaina and Gavin to the area and they "found" it. I really love this sweet little picture. It's one of my all time favorites.